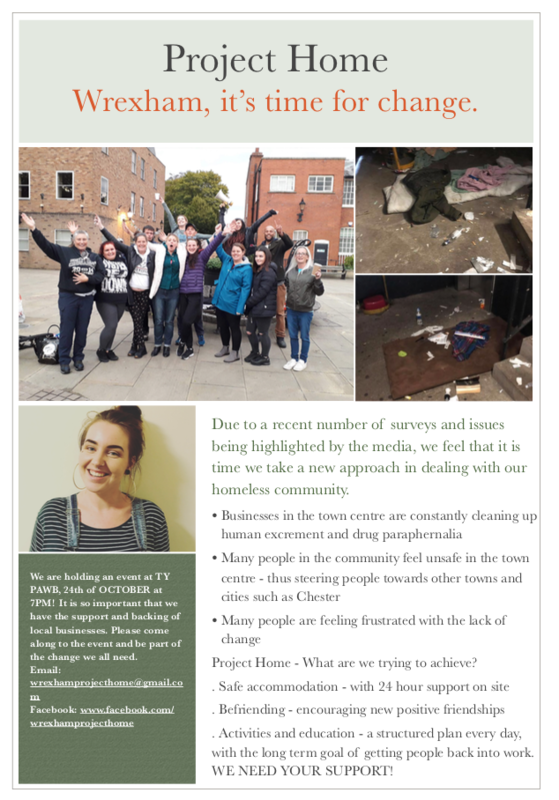 It is without doubt that Wrexham like many other towns and cities faces a significant homeless problem, often combined with mental health issues, substance abuse , trauma, and a chaotic lifestyle for so many, in one of the worlds richest counties. This problem along with other anti-social issues, is a reason why so many people feel unsafe in parts of the town and why they rarely visit Wrexham. This is not good for local people, for business , the town and most of all for the individuals. There is some amazing work being done by numerous agencies, and there are a number of examples of people leaving this chaotic lifestyle to a more normal life. With a roof, running water, sanitary facilities, a home and event jobs. But more needs to be done. A new project is starting in Wrexham, not to undermine the existing service which are stretched to the limit, but rather look at a more joined up, end to end solution, and providing not just a roof – but a home, with help and support. Many of these people are of the most vulnerable in society – they have nothing. You can find out more about project home on their Facebook page. To make this project happen will undoubtedly require resources , so their are all sorts of opportunities to get involved.